Who’s bringing a dessert? Can someone help with appetizers? Here, have some more! Are you really taking another helping? I wish I could eat like you. Ugh, my diet must start tomorrow! Sound familiar? It’s not unusual for pre-Thanksgiving talk between family members to focus on food and food-related tasks. It’s also not uncommon for holiday conversation to revolve around what people are eating or not eating, who’s eating too much or too little and, in some cases, criticism or praise regarding weight and size. To be clear, making sure there’s enough food to feed everyone at a gathering is important, but it doesn’t need to be the center of everyone’s day. When an individual is struggling with an eating disorder, or working hard to maintain recovery from one, these topics can activate disordered thoughts about food, trigger negative body image and impact a person’s ability to be emotionally or physically present at the gathering. Intentionally steering the day towards gratitude and connection instead of food and weight can take a bit of work in our diet-obsessed culture but it stands to benefit many, not just those with eating disorders. Where to start? These are just a few suggestions from our therapists and dietitians. Feel free to share your ideas and recommendations on our Facebook page. Planning activities or bringing a craft for the kids (or adults!) to work on. Pet duty. Someone might really love to take the dogs out for a walk while everyone else is distracted in the kitchen or watching the football game. Ask the musicians of the family to bring their instruments. See if anyone would be willing to put together a slideshow of past Thanksgiving photos for after-dinner viewing. Quick Tip: Tap into everyone’s strengths. If your brother has taken up a recent interest in photography ask if he’d be willing to document the day and capture different positive interactions. How great would it be to have a beautiful photograph of a grandparent rocking a new baby or all the cousins playing football outside? These are, after all, the moments you’d choose to remember about a holiday, not how many calories you ate or an offhanded remark someone made about your weight gain/loss. 2. Give in to the gratitude trend. Gratitude might seem like a big social media gimmick right now but the truth is it does have the power to shift your attitudes and perceptions. The moment dinner is served and everyone sits down to eat can be a moment of peak anxiety if you have an eating disorder. In anticipation of this, Google “gratitude quotes”, pick your favorites and write them on small cards to place at each table setting. Depending on how willing your family is, you could also give everyone a chance to go around and verbally share something for which they are grateful. 4. Identify an ally (or two). Many of us look forward to holidays with great anticipation because we get to spend time with family members we don’t often see. Some of us experience dread and stress for the very same reason. It’s no secret that family dynamics can be complicated. Instead of focusing on family members who are particularly difficult to handle, focus on the ones who can help. If you have a grandparent, cousin or significant other who knows you’re struggling with recovery, have a conversation with them in advance about the ways in which they can support you at the gathering, at the table, and in specific situations throughout the day. 5. Step away from the bathroom scale. If you’re hosting and you have a scale in your house, move it out of sight temporarily, or permanently. If you are a guest in someone else’s house, consider asking them if they can stash it in a closet for the day. As a parent, spouse or support person of someone in recovery, this would be a great thing to take care of in advance as a way to advocate for your loved one. I would love to cuddle with a relative’s new baby. I’m going to talk with each family member about their favorite songs, then compile a playlist to share after the holiday. I will give at least 3 non-appearance related compliments to other people on Thanksgiving day. Quick Tip: Whatever you choose, make sure your goals are easy, achievable and positively worded. Think about adding good things into your experience, instead of avoiding a negative. For example, instead of saying “I won’t go on Facebook during our Thanksgiving get together” say “I look forward to taking a break from social media so I can catch up with my loved ones.” Remember, whatever you focus on will be what you’re focused on. 7. Remember that you cannot control everyone else. We live in a food and weight-obsessed society, so it’s likely some of this conversation will make it’s way into your holiday despite your best efforts. If and when it does, be prepared with ways you can change the conversation, set boundaries and seek support. 8. Give Back – Identify a local charity and ask all the Thanksgiving guests to bring a donation for the cause. Even if the day is hard for you and your recovery you will be left with a visual reminder of everyone’s generosity, (even if they couldn’t stop mentioning how many calories were in the appetizer all day). Thanksgiving can be a truly beautiful holiday that reminds us all to give thanks and reflect upon the positives in life. Taking the focus off food might not only benefit those with an eating disorder but anyone struggling with negative thoughts, low self-esteem or loneliness this holiday season. When we lift the food frenzy and body angst we are better able to focus on gratitude and authentic connection with others and ourselves. Is ‘MyPlate’ Missing the Mark? In conjunction with Michelle Obama’s Let’s Move campaign, The US Department of Agriculture (USDA) released the federal government’s newest national food and nutrition icon on June 2nd. The new icon, referred to as MyPlate, is actually the 7th in a succession of food guides promoted by the USDA over the past 95 years. The most recent predecessor to MyPlate was MyPyramid, introduced in 2005, which most people are relatively familiar with. The new MyPlate is arguably easier to interpret than the pyramid, particularly because MyPlate recommendations are communicated through a simplified visual that consumers use every day – a dinner plate. Michelle Obama had this to say about the usability of the new icon, “When mom or dad comes home from a long day of work, we’re already asked to be a chef, a referee, a cleaning crew. So it’s tough to be a nutritionist, too. But we do have time to take a look at our kids’ plates. As long as they’re half full of fruits and vegetables, and paired with lean proteins, whole grains and low-fat dairy, we’re golden. That’s how easy it is.” Easy as it may seem, we still have some reservations about the new icon, particularly the dietary suggestions and some of the interactive tools that accompany it. Blanket Assumptions. MyPlate’s overall recommendation is: “Enjoy your food, but eat less”. This statement operates under the basic assumption that all Americans overeat which is simply not true. What if the consumer already eats appropriate portions, or perhaps doesn’t eat enough to fuel their body? “Eat less” sounds a lot like a universal prescription for restriction and leaves little room for honoring internal cues for hunger/fullness. Is this just another diet? The reigning factor in MyPlate seems to be focused on control; control your diet and portions within the confines of the plate, and avoid too many of what MyPlate defines as “empty calories” (more on this term later). Healthy, normalized eating involves trusting your own body’s hunger, fullness, and taste cues to help give you everything you need. The My Plate icon could be a helpful reminder of the importance of a balanced diet. However, working overtime to make every meal fit precisely into MyPlate could be more harmful than helpful in establishing a peaceful relationship with food. Furthermore, many of the associated online tools on the USDA website, including “analyze my diet”, food tracking and calorie counters seem to foster an unnecessary focus on precise counting/measuring of foods. Essentially Missing. Fats and oils are not visually represented anywhere on MyPlate despite the fact that fats and oils are necessary for energy, transportation and absorption of vitamins, satiety, taste and texture, heart health, and cholesterol. They are an essential nutrient, and a major component of all brain and nerve cells. The MyPlate website does state that “oils are not a food group, but are essential.” If the goal is healthy and balanced eating, such an essential part of the human diet needs to be represented on this easy-to-read graphic as it was with the last two government food models. Showing healthy ways to incorporate dietary fat and oils into meals could help educate consumers on appropriate amounts of dietary fats and oils as opposed to just instilling a fear of them by ignoring them altogether in the icon. Labeling Foods. Labeling foods as good/bad or healthy/unhealthy is a way of thinking that isn’t making Americans any healthier and can actually promote disordered eating. Yet the USDA website where MyPlate lives continues to assign the “empty calories” label to a long list of foods. A calorie is a measure of energy, equal to the amount of heat that is contained in food and released upon breakdown in the body. All food provides energy to our body – glucose to fuel our cells, protein to build, repair, and maintain body tissues, and fat for healthy cell membranes and brain development. Remember that by incorporating different choices from all food groups, you will naturally be achieving an appropriate balance of calories – thus leaving room for the treats and extras that are physiologically and psychologically satisfying. Removing labels on food, such as “empty calories”, and working to make all foods neutral lends itself to a healthier relationship with food, and helps with food habituation – when you’ve had a food item a multitude of times and can decide freely whether you’ll truly enjoy and taste the food when you have it. Logic. The plate pictures protein, grains, fruits and vegetables with a side of dairy as an ideal meal. How would an average consumer translate this message? Perhaps strawberries just don’t make sense with your Chinese food meal. Does this picture create the notion that every food group must be consumed at every meal? (i.e. veggies with your cereal?) That feels like a lot of pressure. And what about lasagna or casseroles when almost all of the food groups may be combined into one dish – where does that fit into the MyPlate icon? Looking at an overall weekly balance of nutrients and food choices would be more appropriate than feeling as if the eating must be perfect on every plate at every meal. Does it promote overeating? Does the plate send the message that someone should push past their satiety point just to incorporate that fruit or dairy serving? Not honoring the fullness cue could trigger feelings of shame and guilt (not to mention physical discomfort), which can lead to emotional eating or compensatory restricting. So, the next time you sit down to a meal, take a look at your plate. Not in an effort to follow the MyPlate guidelines exactly, but more so to be mindful. Are you choosing a variety of foods from each food group throughout the day or week? Do the food choices make sense and complement each other? Are you able to stop when you feel full? Choosing foods that nurture the body and the mind are all steps on your road to health, and a healthy relationship with food. Do you have questions about MyPlate or other nutritional guidelines? Ask our Registered Dietitians and we’ll post the questions and answers on our blog! Submit questions by emailing kclemmer@sheppardpratt.org anytime before August 10th. Add “ask the dietitian” in the subject line. Today is the 9th annual International No Diet Day (INDD). The campaign was started in 1992 by an author in Britain who had gone through her own recovery from anorexia. What started as a gathering in her living room has grown into a celebration of beauty and health across the globe. 2. Review the facts. Dieting rarely works. 95% of all dieters regain their lost weight and more within 1 to 5 years. 3. Do some research. Next time you see a diet ad, read the extra fine print under the before/after pictures. 5. Use the money you planned to spend on diet products to get a massage, visit a museum, send a gift to an out-of-town friend, OR deposit it in a savings account. We promise it will be more fulfilling. 6. Check out some of our favorite websites and bloggers that advocate a non-diet approach to healthy living for people of every size. 7. Recycle any weight-loss magazines or diet cookbooks. Get creative and turn them into crafts, rip-out the pages and use them as packing paper for breakables. Or simply thrown them in the recycling bin. 8. Better yet: cancel any ongoing subscriptions to diet-laden publications. 9. Do a spring cleaning of your closet. Donate clothes that don’t fit or don’t make you feel good in your body. Remember,clothes are meant to fit your body, not the other way around. 10. Start living. Do the thing you’ve been putting off until you lose X pounds. Go to the beach, take a salsa dancing lesson, go mountain climbing. 11. Reach out for support. If chronic dieting and an intense focus on weight loss has led to serious problems with eating disorders, dangerous weight-loss attempts or feelings of depression, seek professional help. (Not sure if you really need help? You can start with this confidential, self-assessment quiz to find out). 13. Make a list of 10 positive things your body does for you. Hang it on your mirror. 15. Spread the word. Copy the picture above and post to your Facebook profile. 16. Connect to nature. Find some beautiful scenery, sit, relax and be inspired by the natural ability of living things to nourish themselves without external cues from diet companies. You have the same ability. 18. Compliment a friend on a quality not related to appearance OR tell someone you love what makes them beautiful without using words that describe body size, weight or appearance. 19. Add up all of the time you usually spend weighing yourself, counting calories, reading weight-loss articles, feeling badly about your body, or thinking about food. Make a list of all the things you’d rather be doing with that time. Start doing them. 20. Keep on going. Just in case 20 ideas wasn’t enough for you, here’s a list of “50 Ways to Lose the 3 Ds: Dieting, Drive for Thinness, and Body Dissatisfaction” from The National Eating Disorders Association. The Center for Eating Disorders at Sheppard Pratt fully supports the goals and values of International No Diet Day on May 6th and all year long. We hope you have a chance to try at least one of the ideas today, but remember that they don’t expire. These 20 ideas represent steps you can take at any time to start changing your relationship with food and weight. If you or someone you love is struggling with an eating disorder, please visit our website at www.eatingdisorder.org or call us at (410) 938-5252 for information about treatment and support. 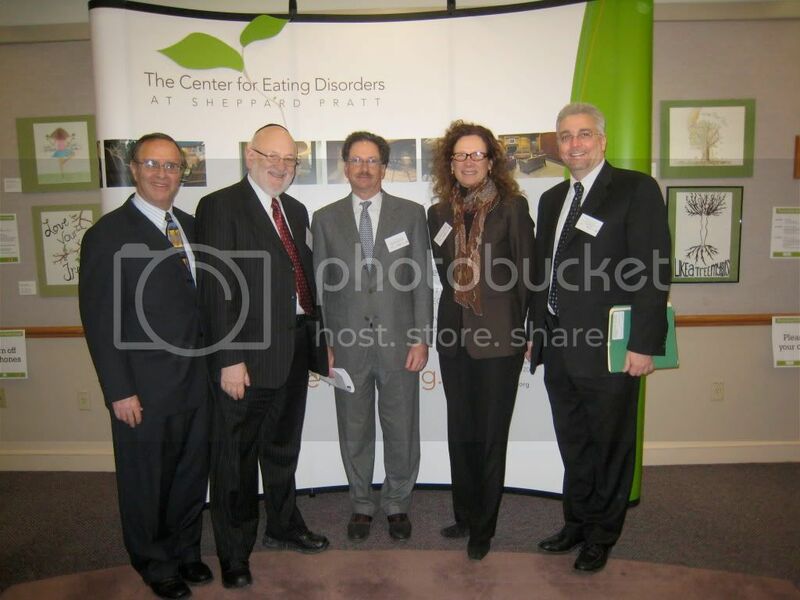 In January of 2010 CED kicked-off the year with a day long conference entitled, Promoting Self-Esteem & Positive Body Image: A Program for the Jewish Community. Despite a lingering snow storm, over 100 community members attended including parents and adolescents, educators and school staff, medical and mental health providers as well as rabbis and Jewish community leaders from Baltimore and surrounding areas. Before NEDAWeek 2010 ended, CED therapist, Craig Boas, LCSW facilitated a community workshop called Mindfulness 101: An Experiential Exploration of DBT Practices for Eating Disorder Recovery and Everyday Life. In addition to these local events, we also launched a blog series called Nurture: A mind and body wellness blog for moms and mothers-to-be. The blog entries helped to provide support around issues of fertility & pregnancy, eating disorders, body image, media and motherhood. In August of 2010, we were honored to host a community presentation by author and parent, Harriet Brown the very day after the release of her book, Brave Girl Eating: A Family’s Struggle With Anorexia. Her talk was inspirational for the many parents and professionals in the audience and stimulated much discussion about Family-Based Treatment (FBT). The Center for Eating Disorders is one of a small number of sites across the country that has clinicians who are specially trained and certified to provide FBT for eating disorders. Several days after the symposium, CED staff members, including CED Associate Director, Dr. Steven Crawford, teamed up with fellow advocates from across the country on Capitol Hill to take part in a Lobby Day organized by The Eating Disorder Coalition (EDC). We spent time meeting with Maryland representatives in congress and senate, discussing how important it is for them to sign on in support of the FREED Act. It was an empowering day and CED is looking forward to being a continuing sponsor of the EDC in the new year. Most recently we were incredibly excited to host our fall outreach event, Intuitive Eating: Making Peace With Food, featuring Evelyn Tribole, MS, RD, a nationally acclaimed nutrition expert and bestselling author. There was a tremendous response from the community, and over 200 people from across Maryland and surrounding states converged in Towson on November 21st to hear Ms. Tribole’s engaging presentation. After the talk, many attendees lined up to speak with her personally about their stories of success with Intuitive Eating. If you missed the presentation, check out the pre-event Q & A with Evelyn Tribole on our blog. Email our Outreach Coordinator to schedule a presentation or workshop for your school or organization in 2011.